N.T. Wright – eminent New Testament scholar and Augsburger Lecture Series guest at Eastern Mennonite University – had just made the point that “image-bearing, God-reflecting” humans were put on this earth by the good and wise Creator to help “the divine project reach its goal” when he paused to take in his surroundings on the Lehman Auditorium stage. N.T. Wright speaks in Lehman Auditorium at Eastern Mennonite University. Wright drew standing-room-only crowds at several events during his two-day visit to Harrisonburg. In a service at Eastern Mennonite Seminary’s Martin Chapel, even the organ bench was occupied, and a breakfast lecture drew area church leaders from various denominations representing a wide spectrum of conservative and progressive perspectives. The coalition that invited Wright was ecumenical: the Missional Church Partnership included Eastern Mennonite Seminary, Park View Mennonite Church, Virginia Mennonite Conference and Virginia Mennonite Missions, and the Church of the Incarnation, Anglican Church of North America. 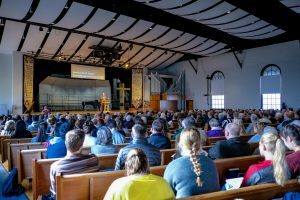 Eastern Mennonite University was represented in the partnership through campus ministries, the Bible, religion and theology department and the Augsburger Lectureship. 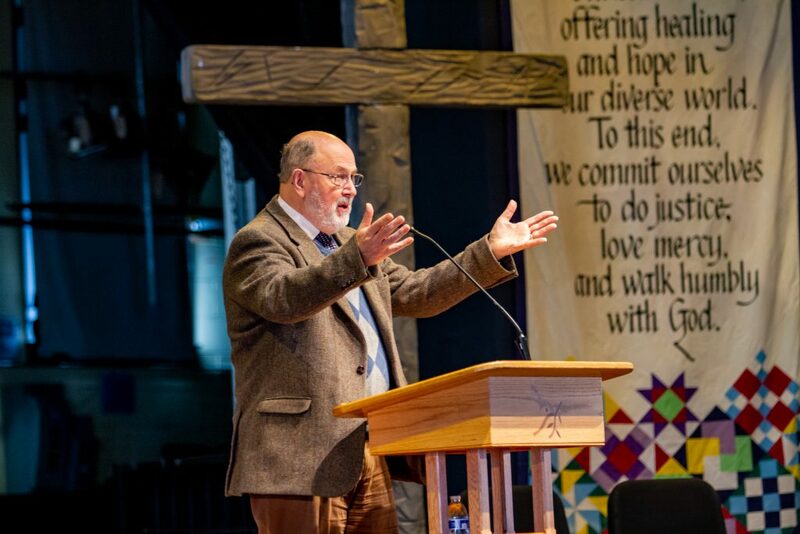 Wright, a research professor of New Testament and early Christianity at the University of St. Andrews in Scotland and former Bishop of Durham, developed the broad theme of “Discerning the Dawn” over five lectures. At James Madison University’s Memorial Hall the first evening, all 1,045 seats were filled, and many turned away at the door. The Augsburger Lecture the next evening at EMU was the most highly attended in many years that he could recall, said Burkholder. The “dawn” of Wright’s thematic focus refers in part to the Kingdom here on earth and to humans’ role as God’s “image-bearers” and “god-reflectors,” he said in an early lecture. Wright’s lecture series drew audience members from as far away as California and Colorado. David Works, who both corresponds with Wright regularly and has long and deep connections to EMU, flew from Denver to attend all of the lectures. A descendant of Thomas Jefferson, Works is member of Coming to the Table, and has participated in Strategies for Trauma and Resilience (STAR) trainings and restorative justice as a survivor of violent crime. For Works, the opportunity to see and hear Wright speak at EMU – where he knew Wright’s message would surely resonate – was irresistible. Nov. 13, Seminary Chapel: “The Spirit and the Church’s Task (John 16:4b–15)” with Q&A beginning at 51:20. Nov. 14, Campus Worship: “The Day the Revolution Began: Atonement the Right Way” with Q&A beginning at 54:40. Nov. 14, Augsburger Lecture: Promised Glory: Straightforth Thinking About God and the World” with Q&A beginning at 1:05:05. Thanks for this lovely article, Lauren. The atmosphere during Mr. Wright’s lectures was electric, and seeing Lehman Auditorium completely full was a joy. Moreover, Mr. Wright’s insights not only encouraged my spirit but also gave me a new lens for extending my academic research. I’m grateful to all who helped bring him here!